The United States population of Hispanic consumers wields a formidable combination of fiscal optimism and buying power in excess of $1 trillion, making progressively more acculturated Latinos a demographic capable of shaping the nation’s future economic and general marketing and ‘Spanish Language Marketing’ trajectory, according to a new report, “Latino Shoppers: Demographic Patterns and Spending Trends Among Hispanic Americans, 8th Edition,” by Packaged Facts. 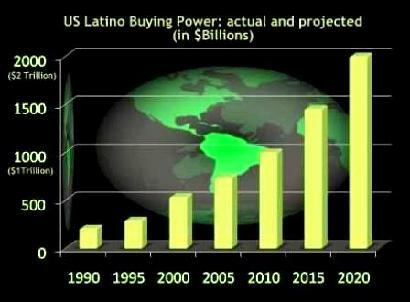 Hispanic buying power reached $1.3 trillion in 2014, an increase of around 25%. Marketers must be aware of how increasing acculturation will affect the decisions of Latino shopping behaviors. Compared to their low–acculturation counterparts, high–acculturation Latinos are much more likely to own credit cards, take out loans and have health and life insurance, according to the report. They are also less influenced by advertising and product placements but are much more alert to in–store promotions. Additionally, they are far more likely to shop and buy online and from catalogs. Packaged Facts further reveals that more education leads to better paying jobs and increasing influence among high–acculturation Latinos, who are more likely than their low–acculturation counterparts to work as managers and professionals, are more likely to own their own homes, and are twice as likely to have a household income of $75,000 or more. Although advertising campaigns have increasingly featured Hispanics and Hispanic themes, marketers targeting Hispanic consumers must recognize substantial regional differences in the composition of the Hispanic population. For instance, Latinos living in western and southwestern states tend to be of Mexican heritage, while Latinos in the Northeast have a much more varied country–of–origin background. With an estimated buying power of $616 billion, Latinos of Mexican heritage represent the single most influential segment of the Hispanic market. Mexicans in the U.S. account for 59% of all Hispanic buying power. On a per capita basis, however, Cubans are the most affluent of the major Hispanic population segments.